They said again and again, "But Jesus is making trouble with the people! He teaches all around Judea. He began in Galilee, and now he is here!" Pilate heard this and asked if Jesus was from Galilee. Pilate learned that Jesus was under Herod's authority. Herod was in Jerusalem at that time, so Pilate sent Jesus to him. When Herod saw Jesus, he was very happy. Herod had heard all about Jesus. So he had wanted to meet Jesus for a long time. Herod wanted to see a miracle. So he hoped that Jesus would do a miracle. Herod asked Jesus many questions, but Jesus said nothing. The leading priests and teachers of the law were standing there. They were shouting things against Jesus. Then Herod and his soldiers laughed at Jesus. They made fun of Jesus by dressing him in clothes like kings wear. Then Herod sent Jesus back to Pilate. In the past, Pilate and Herod had always been enemies. But on that day Herod and Pilate became friends. The trials of Jesus were a mockery. None of them was about justice. The Sanhedrin was not supposed to meet secretly at night. Pilate pronounced Jesus innocent, yet kept the legal proceedings going for political expediency. Herod had no desire to do the right thing; he was determined to do the politically correct thing. This was nothing more than treachery. Jesus was not treated fairly. He did not receive justice. What was done to him was what God decried throughout the Old Testament through the prophets—there was no justice in the courts and those with money and power misused their influence. 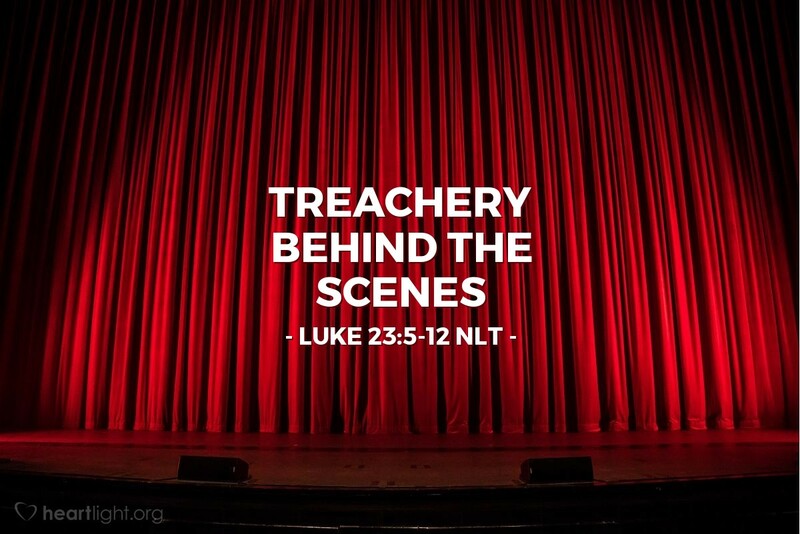 Sinners and traitors convicted Jesus. He was the innocent lamb led to slaughter. He was the perfect sacrifice for all who are sinners ... even for us and those who put him to death. Father, it breaks my heart to see your Son treated with such treachery. While it angers me, it also helps me bear those times that I am treated unfairly. I know that Jesus is with me in those times and that he more than understands my emotions. Thank you for walking in our unfair and often cruel world as one of us so that we can share eternity with you. In Jesus' name. Amen.